A singer once said 'his pitch was right on the nose: his word enunciation letter perfect: his understanding of a song thorough. He will be missed very much, not only by myself, but by his fans all over the world'. The singer was the legendary Frank Sinatra, The man he spoke about: the irreplaceable Matt Monro. "The Singer's Singer: The Life and Music of Matt Monro", is the highly-anticipated story of one of Britain's most iconic singers, tracing Matt Monro's life from his poverty stricken upbringing in post-war Britain to his day job as London bus driver to the steady rise to fame that saw the singer battling the highs and lows of the entertainment industry to become one of Britain's best-loved entertainers. This is the man behind the image, the man who rubbed shoulders with some of the most famous names in the business, who recorded the very first James Bond theme song ("From Russia with Love"), represented his country in Eurovision's Song Contest and Royal Command and recorded the international hits "Softly as I Leave You", "Born Free", "Walk Away" and "Portrait of My Love". In an intimate portrait written by the singer's daughter, Michele Monro, and drawing on more than two hundred interviews from the most important characters in Matt's life, "The Singer's Singer" exposes the man behind the voice, telling the story of how Terry Parson overcame poverty, prejudice and alcoholism to arrive at the very heart of the post-war British entertainment industry as the unforgettable Matt Monro. 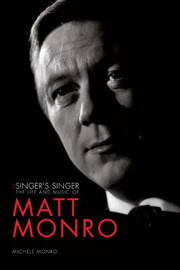 Including never-before-seen photography, exclusive correspondence between Matt and some of the biggest names in the music business and a rich array of personal anecdotes, this is the first comprehensive look at the life of the man his peers dubbed 'the Singer's Singer', the irreplaceable Matt Monro. Michele Monro is the daughter of Matt Monro, and the manager of his estate and fan club.